Stock #91909 Model #9014/785/8 On Sale through 12/31/19. Stock #91911 Model #9016/785/8 On Sale through 12/31/19. Stock #91913 Model #9018/785/8 On Sale through 12/31/19. Stock #91910 Model #9014/785/24 On Sale through 12/31/19. Stock #91912 Model #9016/785/24 On Sale through 12/31/19. Stock #91914 Model #9018/785/8 On Sale through 12/31/19. Our Virco Classroom Desk & Chair Packages are ready to ship in 24 hours! They can be placed in all grade levels and the height adjustability feature makes them fit every student’s needs. 785 Series Open Front Classroom Desk with Medium Oak Laminate Top by Virco features spacious desktops made of high-pressure particleboard laminate. The desk also comes with a plastic bookbox for accommodating books and stationery. 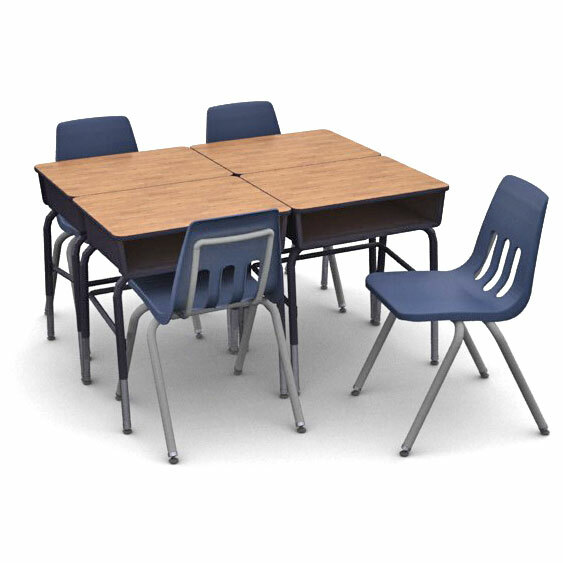 The school desk has tubular steel assembly to ensure durability. 9000 Series Plastic School Chairs by Virco are lightweight and stackable. They feature soft-plastic shells and tubular steel frames with a contoured design to promote right posture. The ventilation slits on the back ensure continuous air circulation. Higher models are suitable for schools, auditoriums conference halls and other similar places. Quick Ship furniture leaves the factory on business days during the advertised time frame, please allow 2-5 days for transit. Offer valid only on orders that contain these Quick Ship items. Please order any other items with standard lead-times separately to ensure prompt delivery. Call us at 800-599-6636 for more information about our Quick Ship program, or to discuss your time sensitive order.